Social network analysis [SNA] is the mapping and measuring of relationships and flows between people, groups, organizations, computers, URLs, and other connected information/knowledge entities. The nodes in the network are the people and groups while the links show relationships or flows between the nodes. SNA provides both a visual and a mathematical analysis of human relationships. Management consultants use this methodology with their business clients and call it Organizational Network Analysis [ONA]. ONA allows you to x-ray your organization and reveal the managerial nervous system that connects everything. To understand networks and their participants, we evaluate the location and grouping of actors in the network. These measures give us insight into the various roles and groupings in a network -- who are the connectors, mavens, leaders, bridges, isolates, where are the clusters and who is in them, who is in the core of the network, and who is on the periphery? While Diane has many direct ties, Heather has few direct connections -- fewer than the average in the network. Yet, in may ways, she has one of the best locations in the network -- she is between two important constituencies. She plays a 'broker' role in the network. The good news is that she plays a powerful role in the network, the bad news is that she is a single point of failure. Without her, Ike and Jane would be cut off from information and knowledge in Diane's cluster. A node with high betweenness has great influence over what flows -- and does not -- in the network. 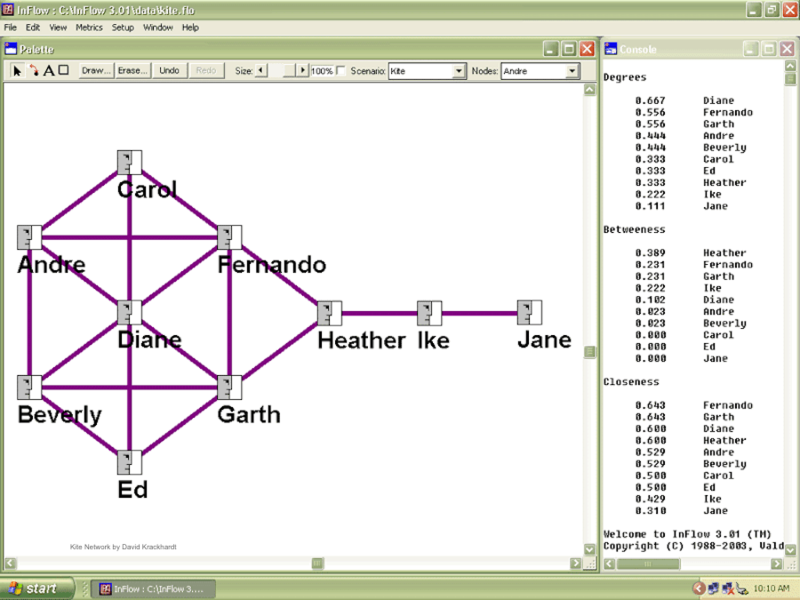 Heather may control the outcomes in a network. That is why I say, "As in Real Estate, the golden rule of networks is: Location, Location, Location." Network metrics are often measured using geodesics -- or shortest paths. They make the (erroneous) assumption that all information/influence flows along the network's shortest paths only. But networks operate via direct and indirect, shortest and near-shortest paths. We often hear interesting things from various sources in the network. Different interpretations arrive via different paths. Therefore, it is important to be on many efficient paths in networks that reach out to various parts of the extended network. Those well integrated in the network of paths have both local and distant information, along with several flavors of it! When sharing network maps and metrics with clients I explain to them that the maps and metrics are mirrors, not report cards! The consultant and the client together make sense of what the maps/metrics reflect about the organization. The consultant brings external expertise and context, while the client provides internal context about the organizations and its goals. Both are necessary to analyze the networks properly! Before sharing the actual network visualizations, I introduce the client to what s/he will see via the Network Discovery Matrix. This 2x2 matrix reveals all of the possibilities that the network maps will reveal. The client will see both good news and bad news about the network, along with expected patterns ad unexpected patterns. 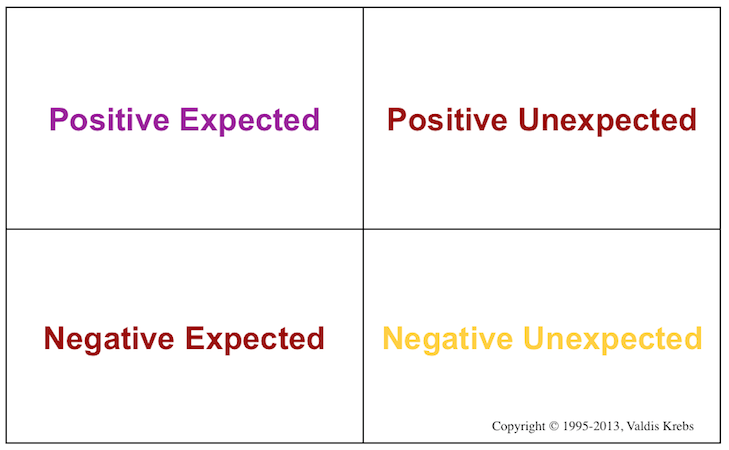 This matrix helps the client' s managers organize, and make sense of, what they will be seeing. If you would like to learn more, ask about our training & mentoring.